ETA (Basque: [eta], Spanish: [ˈeta]), an acronym for Euskadi Ta Askatasuna (Basque pronunciation: [eus̺kaði ta as̺katas̺una]; "Basque Country and Freedom") is an armed Basque nationalist and separatist organization in northern Spain and southwestern France. The group was founded in 1959 and later evolved from a group promoting traditional Basque culture to a paramilitary group engaged in a violent campaign of bombing, assassinations and kidnappings in the Spanish Basque country and throughout Spanish territory. Its goal was gaining independence for the Greater Basque Country. 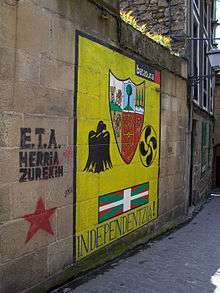 ETA is the main group within the Basque National Liberation Movement and is the most important participant in the Basque conflict. Since 1968, ETA has been held responsible for killing 829 people, injuring thousands and undertaking dozens of kidnappings. The group is proscribed as a terrorist group by Spain, the United Kingdom, France, the United States, and the European Union. This convention is followed by a plurality of domestic and international media, which also refer to the group as "terrorists". There are more than 400 imprisoned members of the group in Spain, France, and other countries. ETA declared ceasefires in 1989, 1996, 1998 and 2006, and subsequently broke them. On 5 September 2010, ETA declared a new ceasefire that is still in force, and on 20 October 2011, ETA announced a "definitive cessation of its armed activity". On 24 November 2012, it was reported that the group was ready to negotiate a "definitive end" to its operations and disband completely. ETA's motto is Bietan jarrai ("Keep up on both"), referring to the two figures in its symbol, a snake (representing politics) wrapped around an axe (representing armed struggle). ETA has changed its internal structure on several occasions, commonly for security reasons. The group used to have a very hierarchical organization with a leading figure at the top, delegating into three substructures: the logistical, military and political sections. Reports from Spanish and French police point towards significant changes in ETA's structures in recent years. ETA has divided the three substructures into a total of eleven. The change was a response to recent captures, and possible infiltration, by the different law enforcement agencies. ETA's intention is to disperse its members and reduce the impact of detentions. The leading committee is formed by 7 to 11 individuals, and ETA's internal documentation refers to it as Zuba, an abbreviation of Zuzendaritza Batzordea (directorial committee). There is another committee named Zuba-hitu that functions as an advisory committee. The eleven different substructures are: logistics, politics, international relations with fraternal organisations, military operations, reserves, prisoner support, expropriation, information, recruitment, negotiation, and treasury. ETA's armed operations are organized in different taldes ("groups") or commandos, generally composed of three to five members, whose objective is to conduct attacks in a specific geographic zone. The taldes are coordinated by the cúpula militar ("military cupola"). To supply the taldes, support groups maintain safe houses and zulos (small rooms concealed in forests, garrets or underground, used to store arms, explosives or, sometimes, kidnapped people; the Basque word zulo literally means "hole"). The small cellars used to hide the people kidnapped are named by ETA and ETA's supporters "people's jails". Currently the most common commandos are itinerant, not linked to any specific area, and thus are more difficult to capture. Among its members, ETA distinguishes between legales/legalak ("legal ones"), those members who do not have police records and live apparently normal lives; liberados ("liberated") members known to the police that are on ETA's payroll and working full-time for ETA; and apoyos ("support") who just give occasional help and logistics support to the group when required. There are also the imprisoned members of the group, serving time scattered across Spain and France, that sometimes still have significant influence inside the organisation; and finally the quemados ("burnt out"), members freed after having been imprisoned or those that are suspected by the group of being under police vigilance. In the past there was also the figure of the deportees, expelled by the French government to remote countries where they live freely. France has since stopped the practice of deporting ETA members to other places than to Spain to be judged. ETA's internal bulletin is named Zutabe ("Column"), replacing the earlier one (1962) Zutik ("Standing"). ETA also promotes the kale borroka ("street fight"), that is, violent acts against public transportation, political parties offices or cultural buildings, destruction of private property of politicians, police, military, journalist, council members, and anyone voicing criticism against ETA, bank offices, menaces, graffiti of political mottoes, and general rioting, usually using Molotov cocktails. These groups are made up mostly of young people, who are directed through youth organisations (such as Jarrai, Haika and Segi). Many of the present-day members of ETA started their collaboration with the group as participants in the kale borroka. 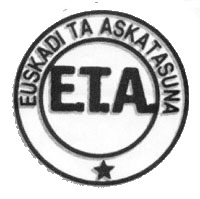 The former political party Batasuna, disbanded in 2003, pursued the same political goals as ETA and did not condemn ETA's use of violence. Formerly known as Euskal Herritarrok and "Herri Batasuna", it is presently banned by the Spanish Supreme Court as an anti-democratic organisation following the Political Parties Law (Ley de Partidos Políticos), It generally received 8% to 15% of the vote in the Basque Autonomous Community. Batasuna's political status is controversial. It was considered to be the political wing of ETA. Moreover, after the investigations on the nature of the relationship between Batasuna and ETA by Judge Baltasar Garzón, who suspended the activities of the political organisation and ordered police to shut down its headquarters, the Supreme Court of Spain finally declared Batasuna illegal on 18 March 2003. The court considered proven that Batasuna had links with ETA and that it constituted in fact part of ETA's structure. In 2003, the Constitutional Tribunal upheld the legality of the law. However, the party itself denies being the political wing of ETA, despite the fact that double membership – simultaneous or alternative – between Batasuna and ETA is often recorded, such as with the cases of prominent Batasuna leaders like Josu Ternera, Arnaldo Otegi, Jon Salaberria and others. The Spanish Cortes (the Spanish Parliament) began the process of declaring the party illegal in August 2002 by issuing a bill entitled the Ley de Partidos Políticos which bars political parties that use violence to achieve political goals, promotes hatred against different groups or seek to destroy the democratic system. The bill passed the Cortes with a 304 to 16 vote. Many within the Basque nationalistic movement strongly disputed the Law, which they consider too draconian or even unconstitutional; alleging that any party could be made illegal almost by choice, simply for not clearly stating their opposition to an attack. Defenders of the new law argue that the Ley de Partidos does not necessarily require responses to individual acts of violence, but rather a declaration of principles explicitly rejecting violence as a means of achieving political goals. Defenders also argue that the ban of a political party is subject to judicial process, with all the guarantees of the State of Law. Batasuna has failed to produce such a statement. As of February 2008 other political parties linked to organizations such as Partido Comunista de España (reconstituido) have also been declared illegal, and Acción Nacionalista Vasca and Communist Party of the Basque Lands (EHAK/PCTV, Euskal Herrialdeetako Alderdi Komunista/Partido Comunista de las Tierras Vascas) were declared illegal in September 2008. This move left no time for the Spanish courts to investigate EHAK in compliance with the Ley de Partidos before the elections were held. The bulk of Batasuna supporters voted in this election for PCTV, a virtually unknown political formation until then. PCTV obtained 9 seats of 75 (12.44% of votes) at the Basque Parliament. The election of EHAK representatives eventually allowed the programme of the now-illegal Batasuna to continue being represented without having condemned violence as required by the Ley de Partidos. Some sources attribute the 1960 bombing of the Amara station in Donostia-San Sebastian (which killed a 22-month-old child) to ETA, but statistics published by the Spanish Ministry of the Interior have always showed that ETA's first victim was killed in 1968. The 1960 attack was claimed by the Portuguese and Spanish left-wing group DRIL (together with four other very similar bombings committed that same day across Spain, all of them attributed to DRIL), and the attribution to ETA has been considered to be unfounded by the researchers. And police documents dating from 1961, released in 2013, show that the DRIL was indeed the author of the bombing. For some in the Spanish opposition, Carrero Blanco's assassination i.e. the elimination of Franco's chosen successor was an instrumental step for the subsequent establishment of democracy. The government responded with new anti-terrorist laws which gave police greater powers and empowered military tribunals to pass death sentences against those found guilty. However, the last use of capital punishment in Spain when two ETA members were executed in September 1975, eight weeks before Franco's death, sparked massive domestic and international protests against the Spanish government. ETA members and supporters routinely claim torture at the hands of Spanish police forces. While these claims are hard to verify, some convictions are based on confessions while prisoners are held incomunicado and without access to a lawyer of their choice, for a maximum of five days. These confessions are routinely repudiated by the defendants during trials as having been extracted under torture. There have been some successful prosecutions of proven tortures during the "dirty war" period of the mid-1980s, although the penalties have been considered by Amnesty International as unjustifiably light and lenient with co-conspirators and enablers. 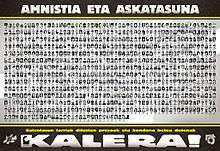 Gestoras pro-Amnistía/Amnistiaren Aldeko Batzordeak ("Pro-Amnesty Managing Assemblies", currently illegal), later Askatasuna ("Freedom") and Senideak ("The family members") provided support for prisoners and families. The Basque Government and several Nationalist town halls granted money on humanitarian reasons for relatives to visit prisoners. The long road trips have caused accidental deaths that are protested against by Nationalist Prisoner's Family supporters. Another Spanish "counter-terrorist" law puts suspected terrorist cases under the central tribunal Audiencia Nacional in Madrid, due to the threats by the group over the Basque courts. Under Article 509 suspected terrorists are subject to being held "incommunicado" for up to thirteen days, during which they have no contact with the outside world other than through the court appointed lawyer, including informing their family of their arrest, consultation with private lawyers or examination by a physician other than the coroners. In comparison, the habeas corpus term for other suspects is three days. In 1992, ETA's three top leaders—"military" leader Francisco Mujika Garmendia ("Pakito"), political leader José Luis Alvarez Santacristina ("Txelis") and logistical leader José María Arregi Erostarbe ("Fiti"), often referred to collectively as the "cúpula" of ETA or as the Artapalo collective—were arrested in the northern Basque town of Bidart, which led to changes in ETA's leadership and direction. These took place all over 2006, not free from incidents such as an ETA cell stealing some 300 handguns, ammunition and spare parts in France on October 2006. or a series of warnings made by ETA such as the one of 23 September, when masked ETA militants declared that the group would "keep taking up arms" until achieving "independence and socialism in the Basque country", which were regarded by some as a way to increase pressure on the talks, by others as a tactic to reinforce ETA's position in the negotiations. Finally, on 30 December 2006 ETA detonated a van bomb after three confusing warning calls, in a parking building at the Madrid Barajas international airport. The explosion caused the collapse of the building and killed two Ecuadorian immigrants who were napping inside their cars in the parking building. At 6:00 pm, José Luis Rodríguez Zapatero released a statement stating that the "peace process" had been discontinued. In April 2009 Jurdan Martitegi was arrested, making him the fourth consecutive ETA military chief to be captured within a single year, an unprecedented police record further weakening the group. The group, and therefore the violence, surged in the middle of 2009, with several ETA attacks leaving three people dead and dozens injured around Spain. The Basque newspaper Gara published an article that suggested that ETA member Jon Anza could have been killed and buried by Spanish police in April 2009. The central prosecutor in the French town of Bayonne, Anne Kayanakis, announced, as the official version, that the autopsy carried out on the body of Jon Anza – a suspected member of the armed Basque group ETA, missing since April 2009 – revealed no signs of having been beaten, wounded or shot, which should rule out any suspicions that he died from unnatural causes. Nevertheless, that very magistrate denied the demand of the family asking for the presence of a family doctor during the autopsy. After this Jon Anza's family members asked for a second autopsy to be carried on. 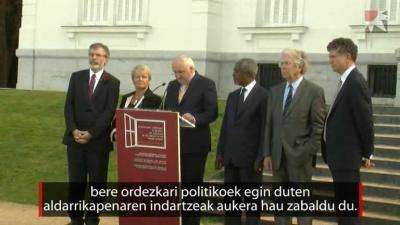 The final declaration of the Donostia-San Sebastián International Peace Conference (17 October 2011) led to an announcement of cessation of armed activity by ETA. On 10 January 2011, ETA declared that their September 2010 ceasefire would be permanent and verifiable by international observers. Observers urged caution, pointing out that ETA had broken permanent ceasefires in the past, whereas Prime Minister José Luis Rodríguez Zapatero (who left office in December 2011) demanded that ETA declare that it had given up violence once and for all. After the declaration, Spanish press started speculating of a possible Real IRA-type split within ETA, with hardliners forming a new more violent offshoot led by "Dienteputo". The day after the ceasefire, in a contribution piece to the New York Times, Tony Blair indicated that lessons in dealing with paramilitary separatist groups can be learned from the way in which the Spanish administration handled ETA. Blair wrote, “governments must firmly defend themselves, their principles and their people against terrorists. This requires good police and intelligence work as well as political determination. [However], firm security pressure on terrorists must be coupled with offering them a way out when they realize that they cannot win by violence. Terrorist groups are rarely defeated by military means alone”. Blair also suggested that Spain will need to discuss weapon decommissioning, peace strategies, reparations for victims, and security with ETA, as Britain has discussed with the Provisional IRA. ETA has declared ceasefires many times before, most significantly in 1999 and 2006, but the Spanish government and media outlets have expressed particularly hopeful opinions regarding the permanence of this most recent proclamation. Spanish premier José Luis Rodríguez Zapatero described the move as "a victory for democracy, law and reason". Additionally, the effort of security and intelligence forces in Spain and France are cited by politicians as the primary instruments responsible for the weakening of ETA. The optimism may come as a surprise considering ETA’s failure to renounce the independence movement, which has been one of the Spanish government’s requirements. In fact, ETA’s ceasefire video ended with the assertion that the struggle for the Basque homeland continues. Less optimistic, Spanish Prime Minister, Mariano Rajoy, of the center-right People's Party (Spain), expressed the need to push for the full dissolution of ETA. The People's Party has emphasized the obligation of the state to refuse negotiations with separatist movements since former Prime Minister José María Aznar was in office. Aznar was responsible for banning media outlets seen as subversive to the state and Batasuna, the political party of ETA. Additionally, in preparation for his party’s manifesto, on 30 October 2011, Rajoy declared that the People's Party would not negotiate with ETA under threats of violence nor announcements of the group’s termination, but would instead focus party efforts on remembering and honoring victims of separatist violence. Alleged heroin traffickers, as "corrupters of Basque youth" and police collaborators, a fix for a tip. The nuclear power plant facilities at Lemoniz (Biscay). In the early 1980s, when the Basque ecologist movement opposed this project, ETA joined this point of view and started a series of attacks against the power plant. Five workers were assassinated by the group, including the execution of a kidnapped engineer Jose Maria Ryan. The site remains deserted. The A-15 highway which was to run through the Leizaran Valley between Navarre and Guipuzcoa. 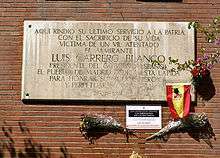 It was inaugurated in 1995, during the construction four people related to the construction were killed by ETA, and over 280 million pesetas were spent by public institutions to cover the losses. The so-called Basque Y, a plan to make the AVE high-speed railways connect the three capital cities of the Basque Autonomous Community. In December 2008, the group killed Ignacio Uria Mendizabal, the Basque owner of one of the companies working in this project. In January 2009, ETA threatened that engineers, senior technicians and executives of companies involved in the construction of the high-speed train line would be targets for assassination as well. Elected parliamentarians, city councillors and ex-councillors, politicians in general: most prominently Luis Carrero Blanco, killed in 1973). Dozens of politicians belonging to the People's Party (PP) and Spanish Socialist Workers' Party (PSOE) have been assassinated or maimed. Some Basque nationalist politicians from the PNV party, such as Juan Mari Atutxa, have also received threats. Hundreds of politicians in Spain require a constant bodyguard service. Bodyguards are contingent victims as well. In 2005 ETA announced that it would no longer "target" elected politicians. Nonetheless, ETA killed ex-council member Isaías Carrasco in Mondragon/Arrasate on 7 March 2008. University professors who publicly express ideas that counter armed Basque separatism: such as Manuel Broseta or Francisco Tomás y Valiente. In the latter case, the shooting resulted in more than half a million people protesting against ETA. Exceptionally, ETA has also assassinated former ETA members such as Maria Dolores González Catarain as a reprisal for having left the group. A number of ETA attacks by car bomb have caused random civilian casualties, like ETA's bloodiest attack, the bombing in 1987 of the subterranean parking lot of the Hipercor supermarket in Barcelona which killed 21 civilians and left 45 seriously wounded, of whom 20 were left disabled; also the attack of Plaza de Callao in Madrid. Bombings (often with car bombs). When the bombs target individuals for assassination they are made by rigging their cars with a bomb. The detonating systems vary: they are rarely manually ignited, but wired so the bomb may explode at ignition or when the car goes over a set speed limit, in the case the bomb is attached directly to the target victim vehicle. Sometimes the bomb is placed inside a stolen car with false plates, parked in the route of the objective, and the explosive remotely activated once the target passes by (i.e., V.I.P. cars, police patrols or military vehicles). These bombs have sometimes killed family members of ETA's target victim and bystanders. When the bombs are large car-bombs seeking to produce large damage and terror, they are generally announced by one or more telephone calls made to newspapers speaking in the name of ETA. Charities (usually Detente Y Ayuda—DYA) have also been used to announce the threat if the bomb is in a populated area. The type of explosives used in these attacks were initially Goma-2 or self-produced ammonal. After a number of successful robberies in France, ETA began using Titadyne. Extortion or blackmail: called by ETA a "revolutionary tax", ETA demands money from a business owner in the Basque Country or elsewhere in Spain, under threats to him and his family, up to and including death threats. Occasionally some French Basques have also been threatened in this manner, such as footballer Bixente Lizarazu. ETA moves the extorted funds to accounts in Liechtenstein and other fiscal havens. According to French judiciary sources, ETA exacts an estimated 900,000 euros a year in this manner. Kidnapping: often as a punishment for failing to pay the blackmail known as "revolutionary tax", but also has been used to try to force the government to free ETA's prisoners under the threat of killing the kidnapped, as in the kidnapping and subsequent execution of Miguel Angel Blanco. ETA hides the kidnapped in underground chambers without windows, called zulos, of very reduced dimensions for extended periods. Also, people robbed of their vehicles are usually tied and abandoned in an isolated place to allow those who assaulted them to escape. Similarly, over the 1990s and, especially, during the 2000s (decade), fluid cooperation between the French and Spanish police, state of the art tracking devices and techniques and, apparently, police infiltration have allowed increasingly repeating blows to ETA's leadership and structure (between May 2008 and April 2009 no less than four consecutive "military chiefs" were arrested). Historically, members of ETA have taken refuge in France, particularly the French Basque Country. The leadership have typically chosen to live in France for security reasons, where police pressure is much less than in Spain. Accordingly, ETA's tactical approach had been to downplay the issue of independence of the French Basque country so as to get French acquiescence for their activities. The French government quietly tolerated the group, especially during Franco's regime, when ETA members could face the death penalty in Spain. In the 1980s, the advent of the GAL still hindered counter-terrorist cooperation between the France and Spain, with the French government considering ETA a Spanish domestic problem. At the time, ETA members often travelled between the two countries using the French sanctuary as a base for operations. With the disbanding of the GAL, the French government changed its position in the matter and initiated in the 1990s the ongoing period of active cooperation with the Spanish government against ETA, including fast-track transfers of detainees to Spanish tribunals that are regarded as fully compliant with European Union legislation in human rights and the legal representation of detainees. Virtually all of the highest ranks within ETA –including their successive "military", "political" or finances chiefs– have been captured in French territory, from where they had been plotting their activities after having crossed the border from Spain. The Spanish Government passed the Ley de Partidos Políticos. This is a law barring political parties which support violence and do not condemn terrorist actions or are involved with terrorist groups. The law resulted in the banning of Herri Batasuna and its successor parties unless they explicitly condemned terrorist actions and, at times, imprisoning or trying some of its leaders who have been indicted for cooperation with ETA. The European Union and the United States list ETA as a terrorist group in their relevant watch lists. The United Kingdom lists ETA as a terrorist group under the Terrorism Act 2000. The Canadian Parliament listed ETA as a terrorist group in 2003. On 2 October 2008, as ETA activity increased, France increased its pressure on ETA by arresting more ETA suspects, including Unai Fano, María Lizarraga on 23 September. and Esteban Murillo Zubiri, brother of Gabriel Zuburi), in Bidarrain. He had been wanted by the Spanish authorities since 2007 when a Europol arrest warrant was issued against him. French judicial authorities had already ordered that he be held in prison on remand. ETA is known to have had 'fraternal' contacts with the Provisional Irish Republican Army; the two groups have both, at times, characterized their struggles as parallel. Links between the two groups go back to at least March 1974. ETA purchased Strela 2 surface-to-air missiles from the IRA and in 2001 unsuccessfully attempted to shoot down a jet carrying the Spanish Prime Minister, Jose Maria Aznar. It has also had links with other militant left-wing movements in Europe and in other places throughout the world. The Colombian government stated that there are contacts between ETA and the Colombian guerrillas FARC. The recent capture of FARC's leaders' computers, and leaked email exchanges between both groups, show that ETA members received training from FARC. Apparently, FARC asked for help from ETA in order to conduct future attacks in Spain, but the Anncol news agency later denied it, clarifying that the Spanish capital Madrid had been confused with a city in northern Colombia also named Madrid. Following a judicial investigation, it was reported that FARC and ETA had held meetings in Colombia, exchanging information about combat tactics and methods of activating explosives through mobile phones. The two organizations were said to have met at least three times. One of the meetings involved two ETA representatives and two FARC leaders, at a FARC camp, and lasted for a week in 2003. FARC also offered to hide ETA fugitives while requesting anti-air missiles, as well as asking ETA to supply medical experts who could work at FARC prison camps for more than a year. In addition, and more controversially, FARC also asked ETA to stage attacks and kidnappings on its behalf in Europe. Asesinato en febrero at the Internet Movie Database, about the families of Basque politician Fernando Buesa and his bodyguard, both killed by ETA. Perseguidos at the Internet Movie Database, Eterio Ortega and Elías Querejeta interview local councillors threatened by ETA. Trece entre mil at the Internet Movie Database, the testimony of some of ETA's victims in the last 30 years by filmmaker Iñaki Arteta. Escape from Segovia (1981) at the Internet Movie Database, about the Segovia prison break when ETA prisoners escaped from Segovia prison. GAL at the Internet Movie Database, about the journalistic research leading to the uncovering of the state-supported GAL. In the game Counter Strike: Global Offensive, there are maps in which the players playing on the terrorist team play as members of a terrorist group which bears a resemblance to the ETA (known in game as the 'Separatists'), they would also fight GIGN and the SAS. ↑ "Los últimos 202 de la lista de ETA". 20minutos. Retrieved 12 April 2011. ↑ "ETA cuenta ahora solo con 50 terroristas libres y en activo". elpais.com. 4 September 2011. ↑ (Spanish) Goiz Argi. Goiz Argi. Retrieved on 30 January 2011. ↑ (Spanish) Goiz Argi. Goiz Argi (27 January 2002). Retrieved on 30 January 2011. ↑ "Lista de víctimas mortales". Ministerio del Interior (in Spanish). Retrieved 19 September 2010. ↑ "Datos significativos del conflicto vasco, 1968–2003". Eusko News (in Spanish). 2003. Retrieved 19 January 2011. 1 2 Peace at Last? | People & Places|Smithsonian Magazine. Smithsonianmag.com. Retrieved on 30 January 2011. ↑ Foreign Terrorist Organizations (FTOs). Retrieved on 16 April 2013. ↑ "Eta gives terrorists disguise manual". The Independent. London. 15 December 2007. Retrieved 27 March 2010. ↑ Owen, Edward (7 August 2007). "Eta terrorists demand protection money". The Daily Telegraph. London. Retrieved 27 March 2010. ↑ Spain's rail ambitions: Ave Madrid. The Economist (5 February 2009). Retrieved on 30 January 2011. ↑ Spanien: Mutmaßliche Eta-Terroristen gefasst – SPIEGEL ONLINE – Nachrichten – Politik. Spiegel.de (2 July 2007). Retrieved on 30 January 2011. ↑ "81 terroristas de ETA abandonan la cárcel en 2014 y dejan la cifra de presos etarras en 465". Cronica Global, 2 January 2015. Retrieved 5 February 2015. 1 2 3 "Basque separatist group Eta 'declares ceasefire'". BBC News. 5 September 2010. Retrieved 5 September 2010. 1 2 "Basque group Eta says armed campaign is over". BBC News. 20 October 2011. Retrieved 20 October 2011. ↑ "Basque separatists Eta 'ready to disband'". BBC. ↑ POLÍTICA – ETA ha modificado su estructura interna por motivos de seguridad. El Correo Digital (1 December 1997). Retrieved on 30 January 2011. ↑ «El técnico» construyó los zulos de ETA, La Razón, 18 October 2004. ↑ Riding, Alan. (11 July 1992) OLYMPICS – OLYMPICS – Keeping Terrorism at Bay in Barcelona – NYTimes.com. New York Times. Retrieved on 30 January 2011. ↑ Wayne Anderson (January 2003). The ETA: Spain's Basque terrorists. The Rosen Publishing Group. pp. 42–. ISBN 978-0-8239-3818-6. Retrieved 30 January 2011. ↑ Elecciones en el País Vasco 2005. elmundo.es. Retrieved on 30 January 2011. ↑ "ETA's political wing elects new leaders". BBC News. 14 February 1998. Retrieved 2 May 2010. ↑ "Basque nationalist leader jailed". BBC News. 26 May 2005. Retrieved 2 May 2010. 1 2 De la dirección de Batasuna a la de ETA · ELPAÍS.com. Elpais.com. Retrieved on 30 January 2011. ↑ El Congreso aprueba la Ley de Partidos con el 95% de los votos, El Mundo, 5 June 2002. 1 2 ""El nuevo partido de la izquierda abertzale se denomina 'Sortu'", La Vanguardia, 8 February 2011". LA VANGUARDIA. Retrieved 29 November 2014. ↑ "Spanish supreme court bans Basque separatist party Sortu for links to ETA". BBC Monitoring European. BBC Worldwide Limited. Retrieved 30 March 2011. ↑ Basque parliament election 1998. Retrieved 22 April 2009. ↑ 2001 Basque parliament election. Retrieved 22 April 2009. ↑ Sat, 22 Nov 2008 – Bringing an end to Eta campaign. The Irish Times (11 November 2008). Retrieved on 30 January 2011. ↑ Euskobarómetro – EUSKOBAROMETRO MAYO 2009. Alweb.ehu.es. Retrieved on 30 January 2011. ↑ Más del 85% apuesta por el derecho a decidir y por el diálogo sobre el marco – GARA – euskalherria.com. Gara.euskalherria.com (11 December 2006). Retrieved on 30 January 2011. ↑ "Basques Stir Ferment in Spain". The News and Courier. 1 October 1968. Retrieved 21 October 2011. 1 2 "ETA: from student group to Basque bombers". The Daily Telegraph. 20 October 2011. Retrieved 21 October 2011. ↑ Kurlansky, Mark (2004). 1968. London: Jonathan Cape (Random House). p. 254. ISBN 0-224-06251-4. 1 2 3 Conversi, Daniele (1997). The Basques, the Catalans, and Spain. London: C. Hurst & Co. pp. 92–97. ↑ Ediciones El País. ""La primera víctima de ETA" El Pais, 31 January 2010". EL PAÍS. Retrieved 29 November 2014. 1 2 "¿La primera víctima de ETA?" (in Spanish). El Correo. 19 June 2010. Retrieved 23 October 2011. ↑ "Últimas víctimas mortales de ETA: Cuadros estadísticos". Spanish Ministry of the Interior. Retrieved 23 October 2011. 1 2 Núñez, Javier (21 February 2010). "Verdad eclipsada ('Eclipsed truth')" (in Spanish). Deia. Retrieved 9 August 2011. ↑ "Cómo se construye una mentira" (in Spanish). Gara. 9 February 2010. Retrieved 23 October 2011. ↑ "Begoña Urroz afera" (PDF) (in Basque). Berria. 20 February 2011. Retrieved 23 October 2011. ↑ "El DRIL mató a Begoña Urroz, y no ETA, según documentos de la Policía" (in Spanish). EITB. 5 May 2013. Retrieved 6 May 2013. ↑ "El primer día en el que ETA asesinó". Elpais.com. Retrieved on 30 January 2011. ↑ "40 aniversario del Proceso de Burgos". El Mundo. 3 December 2010. Retrieved 21 October 2011. ↑ Sullivan, John (1988). ETA and Basque nationalism: the fight for Euskadi. London: Taylor and Francis. pp. 128–9. Gaizka Fernández Soldevilla, Agur a las armas. EIA, Euskadiko Ezkerra y la disolución de ETA político-militar (1976–1985), en Sancho el sabio. Revista de cultura e investigación vasca, ISSN 1131-5350, Nº 33, 2010, pp. 55–96 Enlace al artículo en pdf Consultado: 8 March 2011. 1 2 Diego Carcedo (2004). Sáenz de Santa María. El general que cambió de bando. Madrid: Temas de Hoy. p. 437. ISBN 84-8460-309-1. ↑ Talking to Terrorists: Making Peace in Northern Ireland and the Basque Country (pp. 197–202), John Bew, Martyn Frampton, and Inigo Gurruchaga, Hurst & Co., London. ↑ Europe | Former Spanish ministers jailed for 'terrorism'. BBC News (12 September 1998). Retrieved on 30 January 2011. ↑ "Los etarras escriben su historia…Euskal Memoria". Minuto digital. Retrieved 29 November 2014. ↑ "474 personas han muerto por la represin desde 1960 - GARA". Retrieved 29 November 2014. ↑ "Cincuenta y seis etarras han muerto en enfrentamientos con las fuerzas de seguridad". ABC. Retrieved 29 November 2014. 1 2 ETA aleccionó al 'comando' de la T-4 sobre cómo denunciar torturas – Público.es. Publico.es. Retrieved on 30 January 2011. ↑ October 2002 AI Index: EUR 41/12/2002: SPAIN: A briefing for the United Nations Committee against Torture: Although convictions of torturers occur, these are rare. ... examining judges and prosecutors may not always be displaying due diligence ... trials involving torture complaints are often delayed for long periods. Where torture has been found to have occurred and torturers are convicted, awards of compensation by courts to torture victims are usually low and may take between seven and 19 years to be decided. ↑ "2008 Report on Spain". Amnesty International. Archived from the original on 11 June 2008. Retrieved 19 June 2008. ↑ Reporters sans frontières. Rsf.org (10 December 2010). Retrieved on 30 January 2011. ↑ Informativos Telecinco.com – Internacional – Trece muertos y más de cincuenta heridos en dos atentados suicidas en Bangladesh. Informativos.telecinco.es. Retrieved on 30 January 2011. ↑ Webb, Jason (16 January 2007). "ANALYSIS-Spain's PM down but not out after ETA bomb". Reuters. ↑ Europe | Spain papers point finger at Eta. BBC News (12 March 2004). Retrieved on 30 January 2011. ↑ ETA cease-fire, eitb24, 23 March 2006. ↑ (Spanish) (French) (Basque) ETA declara un alto el fuego permanente para impulsar un proceso democrático ("ETA declares a permanent ceasefire to give impetus to a democratic process"), Gara, 3 March 2006 (article in Spanish, text of announcement in Basque, Spanish and French. ↑ News – ETA to follow Kosovo example. B92 (5 January 2008). Retrieved on 30 January 2011. 1 2 3 Burnett, Victoria (20 April 2009). "Spain Hails Arrest of Man Seen as ETA Leader". The New York Times. Retrieved 27 March 2010. ↑ Altuna, Iñaki (16 May 2009). "El refugiado donostiarra Jon Anza está desaparecido desde el pasado 18 de abril". Gara. Retrieved 20 October 2011. ↑ "CP reports verdict of death by natural causes in case of Anza". ↑ "Autopsy carried out without family doctor". ↑ "ETA hardliners warns of IRA-type split within ETA". Barcelona Reporter. barcelonareporter.com. Retrieved 23 March 2011. ↑ "Doce pistoleros en estado de alerta". Interviu. Retrieved 23 March 2011. ↑ "Un 'histórico' dirige la posible escisión en ETA". Diario Crítico. diariocritico.com. Retrieved 23 March 2011. ↑ "Annan and Adams top list of experts at Donostia Peace Conference". EITB.com. 17 October 2011. Retrieved 18 October 2011. 1 2 Blair, Tony. “A Basque Peace.” The New York Times: Opinion Pages 21 October 2011. <http://www.nytimes.com/2011/10/22/opinion/22iht-edblair22,1.html>. ↑ Euronews. “ETA Ceasefire: Politicians and Public React.” Youtube.com. 21 October 2011. Euronews Channel. 27 October 2011 <https://www.youtube.com/watch?v=1OCkyZ7dlq8>. 1 2 Burns, John F. “Basque Separatists Halt Campaign of Violence.” The New York Times: Europe 20 October 2011. <http://www.nytimes.com/2011/10/21/world/europe/eta-basque-separatists-declare-halt-to-violence-in-spain-and-france.html>. 1 2 TeleSur English. “Basque Group ETA Declares End to Armed Conflict.” Youtube.com. 20 October 2011. Telesur. 25 October 2011 <https://www.youtube.com/watch?v=4gtUk-Q6WkU&feature=related>. ↑ Blum, Andrew. “Ending with ETA? : Elusive Peace in the Basque Country.” Washington, D.C.: United States Institute for Peace, 2011. ↑ “Mariano Rajoy Says the PP Will Not Talk to ETA”. Typically Spanish: Spain News: National. 30 October 2011. <http://www.typicallyspanish.com/news/publish/article_32500.shtml>. ↑ Minder, Raphael. “Peace Deal with Basque Separatists Still Tentative.” The New York Times: Europe 28 October 2011. <http://www.nytimes.com/2011/10/29/world/europe/peace-deal-with-basque-separatists-still-tentative.html?scp=1&sq=basque&st=cse>. ↑ Basque Democratic Alternative. Web.archive.org (27 October 2009). Retrieved on 30 January 2011. 1 2 El fantasma de Lemóniz | Nacional|Terrorismo. Abc.es. Retrieved on 30 January 2011. ↑ Resolución n.º 58/1997, de 13 de octubre, del Presidente del Tribunal Vasco de Cuentas Públicas, por la que se hace público el Informe de Fiscalización "Autovía Irurtzun-Andoain: Tramo guipuzcoano (II)", Boletín Oficial del País Vasco 1997203 – 23 October 1997, page 16890. ↑ Boletín Oficial del Parlamento de Navarra Nº 38, 27 May 1997, p. 9. ↑ ETA convierte las obras del Tren de Alta Velocidad en un objetivo estratégico, Óscar B. de Otálora, El Diario Vasco, 4 November 2007. ↑ Basque entrepreneur killed in Basque town of Azpeitia – EiTB News Politic. Eitb.com. Retrieved on 30 January 2011. ↑ ETA amenaza a "ingenieros, técnicos y responsables" del AVE vasco · ELPAÍS.com. Elpais.com. Retrieved on 30 January 2011. ↑ Terrorist Group Profiles. DIANE Publishing. 1 August 1989. pp. 37–. ISBN 978-1-56806-864-0. Retrieved 30 January 2011. ↑ ETA asesina a un empresario nacionalista · ELPAÍS.com. Elpais.com. Retrieved on 30 January 2011. ↑ Fuchs, Dale (20 June 2005). "Anger and doubts greet promise by Eta not to target Spanish politicians". The Guardian. London. Retrieved 2 May 2010. ↑ Hamilos, Paul (8 March 2008). "Spain cancels election rallies after murder". The Guardian. London. Retrieved 2 May 2010. ↑ "Spanish prosecutor shot dead". BBC News. 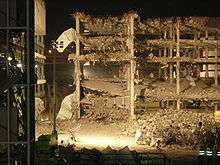 9 October 2000. Retrieved 27 March 2010. ↑ Simons, Marlise. (18 July 1997) Spain Turns on Rebels With Outrage – NYTimes.com. The New York Times. Retrieved on 30 January 2011. 1 2 "Spanish cinema breaks ETA taboo". BBC News. 4 April 2000. Retrieved 2 May 2010. ↑ "MIPT Terrorism Knowledge Base". Retrieved 29 November 2014. ↑ "European press review". BBC News. 25 May 2001. Retrieved 2 May 2010. ↑ Knewstub, Nikki (19 June 2005). "Eta to end attacks on elected politicians". The Guardian. London. Retrieved 2 May 2010. ↑ La Razón Digital – ETA retoma el uso de las granadas «Jotake» para atentar contra cuarteles. Web.archive.org (19 March 2008). Retrieved on 30 January 2011. ↑ "ETA tries to justify 'tax' on Lizarazu". The Independent. London. 21 March 2001. Retrieved 2 May 2010. ↑ Nash, Elizabeth (31 March 2008). "Bank accounts linked to Eta are frozen in Liechtenstein". The Independent. London. Retrieved 2 May 2010. ↑ ETA recauda anualmente 900.000 €, según la Policía francesa. elConfidencial.com. Retrieved on 30 January 2011. ↑ El zulo de Aldaya y Delclaux – Los secuestros de ETA – ELPAÍS.com. Elpais.com (30 October 2002). Retrieved on 30 January 2011. ↑ "Spanish Police Free 2 Kidnapped by the Basques". The New York Times. 2 July 1997. Retrieved 2 May 2010. 1 2 3 Basque terrorism: Dying spasms. The Economist (6 August 2009). Retrieved on 30 January 2011. ↑ : Últimas víctimas mortales Cuadros Estadísticos- ???plantilla_home.title??? :. Mir.es (30 July 2009). Retrieved on 30 January 2011. ↑ RFI – Question basque – Paris, cible du terrorisme basque ?. Rfi.fr (28 August 2002). Retrieved on 30 January 2011. ↑ Europe | 'Eta attack' kills second officer. BBC News (5 December 2007). Retrieved on 30 January 2011. ↑ ETA rompe la baraja en suelo francés · ELPAÍS.com. Elpais.com. Retrieved on 30 January 2011. ↑ El Imparcial: Noticias: ETA maneja un presupuesto de dos millones de euros al ańo. Elimparcial.es (25 January 2008). Retrieved on 30 January 2011. 1 2 Wilkinson, Isambard (2 March 2002). "Payback for Eta in the Pays Basque". The Daily Telegraph. London. Retrieved 27 March 2010. ↑ Spain looks to France for help against Basque separatists. France24 (26 September 2008). Retrieved on 30 January 2011. ↑ ETA pide el tercer grado para sus presos Libertad Digital, 5 October 2003, quoted in "La dispersión de los presos de ETA" (PDF). (47.2 KB) (p. 9), a PDF in the ¡Basta Ya! site. ↑ Ley Orgánica 6/2002, de 27 de junio, de Partidos Políticos. Noticias.juridicas.com (21 January 2011). Retrieved on 30 January 2011. ↑ Testimony by Martxelo Otamendi at the Universal Forum of Cultures, Barcelona (May 2004). ↑ "The Fall of Spain's Most Wanted". Time. 24 May 2008. Retrieved 2 May 2010. ↑ Spanish government speaks of the significance of latest ETA arrests in France. Typicallyspanish.com (22 May 2008). Retrieved on 30 January 2011. ↑ AFP: Spanish police dismantle ETA's 'most active' cell. Afp.google.com (22 July 2008). Retrieved on 30 January 2011. ↑ France arrests Basque ETA suspects – CNN.com. Edition.cnn.com (26 July 2008). Retrieved on 30 January 2011. ↑ "NZherald.co.nz". The New Zealand Herald. Retrieved 29 November 2014. ↑ France arrests third alleged ETA terrorist in two weeks. Typicallyspanish.com (3 October 2008). Retrieved on 30 January 2011. ↑ "InterNations - the Community for Expatriates and Global Minds". Retrieved 29 November 2014. ↑ "Eta terrorist Inaki de Juana Chaos to give himself up at Belfast court". The Times. London. 13 November 2008. Retrieved 27 March 2010. ↑ A history of Iparretarrak, by Eneko Bidegain, Euskonews & Media, 2006. ↑ Tim Pat Coogan (2002). The IRA. Palgrave Macmillan. pp. 436–. ISBN 978-0-312-29416-8. Retrieved 30 January 2011. ↑ Europe | Adams urges ETA towards peace. BBC News (20 September 1998). Retrieved on 30 January 2011. ↑ Govan, Fiona. (18 January 2010) Spanish PM 'saved' by faulty IRA missile. Telegraph. Retrieved on 30 January 2011. ↑ Colombia VP says FARC sought ETA ties for attack in Spain. Tehran times (1 June 2008). Retrieved on 30 January 2011. 1 2 Colombia: FARC sought to launch attack with ETA France24. Retrieved on 30 January 2011. ↑ Colombia: Sospechan relación de ETA con las FARC General Commander Fernando Tapias in August 2001. ↑ FARC and ETA exchanged information about military tactics – report | Earth Times News. Earthtimes.org (13 November 2008). Retrieved on 30 January 2011. ↑ Saviano dice que ETA "es paramafiosa y trafica con cocaína" · ELPAÍS.com. Elpais.com. Retrieved on 30 January 2011. ↑ Conferencia de Prensa ofrecida por Felipe Pérez Roque, Ministro de Relaciones Exteriores de Cuba. Centro de Convenciones "Atlapa" de la Ciudad de Panamá. 7 November 2000. ↑ Country Reports on Terrorism: Released by the Office of the Coordinator for Counterterrorism (28 April 2006): The Government of Cuba maintains close relationships with other state sponsors of terrorism such as Iran and North Korea, and has provided safe haven to members of ETA, FARC, and the ELN. There is no information concerning activities of these or other organizations on Cuban territory. Press reports indicate that fugitives from US justice and ETA members are living legally in Cuba, just like fugitives from Cuban justice live legally in the US. The United States says it is not aware of specific terrorist enclaves in the country. ↑ "Acusan a la comunidad mapuche de relacionarse con ETA y con las FARC". El Mundo (in Spanish). September 6, 2009. Retrieved November 18, 2015. ↑ "Le preocupaba vínculo de mapuches, FARC y ETA". RioNegro (in Spanish). December 14, 2010. Retrieved November 18, 2015. ↑ Part 1 : <https://www.youtube.com/watch?v=GboAdQXrOyk> and Part 2 : <www.youtube.com/watch?v=GboAdQXrOyk>. Enric Martinez-Herrera, ""National Extremism and Outcomes of State Policies in the Basque Country, 1979–2001"" (PDF). (119 KiB, ) originally published in the International Journal on Multicultural Studies, Vol. 4, No. 1, 2002. Wikimedia Commons has media related to ETA.